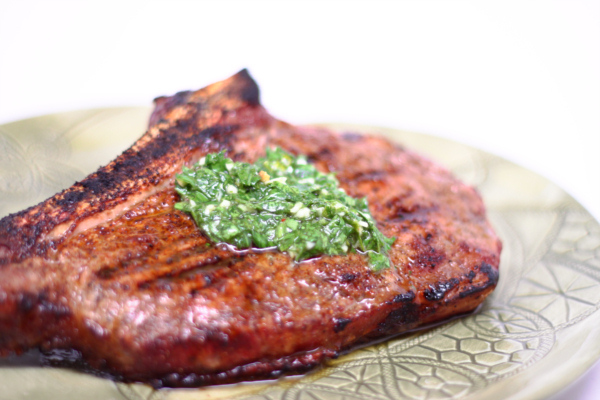 Chimichurri sauce is a great condiment – super low cal, but bursting with flavor. Served atop this already super savory steak, you can’t go wrong. Place meat on a baking pan. Mix together the meat rub spices and sprinkle on both sides of the meat then rub it in and cover with plastic and chill 1 hour. Mix the chimichurri ingredients other than the oil in a blender or food processor then slowly add oil as mixture is blending. Heat grill and cook meat 5-6 minutes each side or until desired doneness. Serve with sauce.